Home » Economy » Working Families Helped by SCOTUS Union Decision. Here’s Why. Working Families Helped by SCOTUS Union Decision. Here’s Why. The only thing more pathetic than the embarrassing lament from Democrats after the Supreme Court delivered a big kick between the legs of big labor with the Janus decision is the enormity of their falsehood about what SCOTUS did to working families. If party pronouncements ring true and public sector unions have their wings clipped, working families could be helped by lessening the debt burden on taxpayers in states where unions control the public workforce. Union decision a disaster for whom? Without repeating all the details, suffice it to say that the high court said no to the legality of public sector unions shaking down non-union workers for fees. That means more money in workers’ pockets if they don’t want to join, less collected in dues and fees by big labor, and a big mea culpa from Democrats who have to explain how the hell something like this could happen thanks to a worker in a state notorious for its very expensive public workforce. Western civilization won’t end and working families won’t be poverty stricken because SCOTUS refused to side with Democrats. The truth is that big labor’s admission price doesn’t matter to most workers because not many people work for unions. Unions aren’t the ticket to a middle class lifestyle. They are becoming an anachronism unless you work for government or belong to the Democratic Party. Bang the drum for working families if you wish, but those lucky enough to land public sector jobs don’t often find themselves in the poorhouse. Many Americans would jump at the chance to have a gig with good pay and lifetime retirement benefits. The press releases keep coming. Here is the truth you aren’t going to hear unless your understanding of what “profound” means is a lot different than mine. Seven states claim over half of the nation’s union members: California, New York, Illinois, Michigan, Pennsylvania, New Jersey, and Ohio.5 According to the Orange County Register, California taxpayers are privy to almost $1 trillion in unfunded public pension liability. Illinois, New York, and New Jersey also deserve accolades for soaring pension debt according to Federal Reserve data released in January 2018. If you think the situation has improved you don’t live in one of the states where public sector benefits are so excessive that the debt, taxes, and fees they create threaten working families who don’t have these unionized jobs and make up the majority of the workforce. They aren’t sharing in the benefits so they are hurt, not helped by the additional taxes. There is no need to waste time with a chicken or egg discussion. It’s not unfair to suggest that the same leftist fiscal policies that claim labor union participation should be the goal of every worker contribute to the downfall of state economies. Unjustified overreaction: how many working families, exactly? We can chop the numbers down to prove Democrats wrong and show how insignificant the union decision is for working families. There were 7.2 million public sector union workers in 2017.6 Compare that to the 161.57 million workers in the labor force and that puts the union decision in proper perspective. Only 4.46% of workers belong to a union impacted by this case. Of the 16.4 million union workers in the U.S. who were represented by big labor, only 1.6 million don’t belong to a union.8 Even if we assume that every one of these people were ducking fees for a public sector union, it would still be a small percentage of union labor. Compared to the entire U.S. labor force the number is so small that it’s not even worth talking about. The public-sector union membership rate is five times higher than it is for the private sector. 9 That’s a bad government problem, not a Supreme Court problem. When government loses control of its workforce bad things happen. Who runs state government in California, New York, and Illinois? You guessed right. If every employee in every public service job suddenly stopped paying dues it would be a problem for unions, but that’s not going to happen and it’s not the argument Democrats chose to defend big labor. Instead, they decided to drag working families out of their bag of tricks. Perhaps it’s unfair to blame them. Maybe they listened to their union backers instead of taking the time to look at the facts, or possibly it never occurred to them that higher taxes that pay for union perks and benefits hurt taxpayers. Sounding stupid is one thing. Being wrong as well is a whole lot worse. July 6, 2018: Who is America Needs Unions and why do we need them? According to this morning’s new “Employment Situation Summary” we added another 213,000 jobs last month.12 Compare that to 2 million union workers and what is being sold as the end of the world for working families and ask yourself: how much longer before we wash our hands of these expensive 19th century dinosaurs once and for all? *Clarification: this figure is for the total civilian labor force. Of these 161.5 million people, 155.47 million were employed in May 2018. In June 2018 the numbers edged up to 162.14 million in the labor force and 155.57 employed. 1. “Bonamici Statement on Supreme Court Decision in Janus v. AFSCME Council 31.” Suzanne Bonamici. June 27, 2018. https://bonamici.house.gov/media/press-releases/bonamici-statement-supreme-court-decision-janus-v-afscme-council-31, retrieved July 3, 2018. 2. “Statement on Supreme Court Ruling in Janus v. AFSCME.” Brad Schneider. June 27, 2018. https://schneider.house.gov/media/press-releases/statement-supreme-court-ruling-janus-v-afscme, retrieved July 3, 2018. 3. “Schakowsky, Hoyer, Schneider, Krishnamoorthi Join Public Service Union Members and Leaders to Respond to Anti-Worker Janus Decision.” Jan Schakowsky. 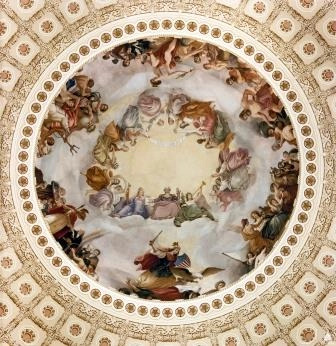 July 2, 2018. https://schakowsky.house.gov/press-releases/schakowsky-hoyer-schneider-krishnamoorthi-join-public-service-union-members-and-leaders-to-respond-to-antiworker-janus-decision/, retrieved July 5, 2018. 4. “Cartwright Denounces Supreme Court Decision on Janus v. AFSCME.” Matt Cartwright. June 27, 2018. https://cartwright.house.gov/media-center/press-releases/cartwright-denounces-supreme-court-decision-on-janus-v-afscme, retrieved July 3, 2018. 5. 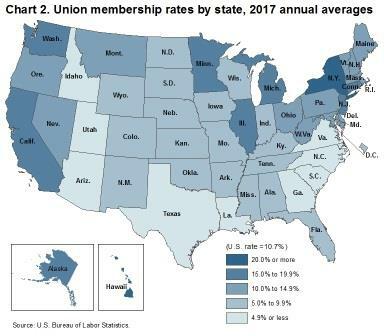 “Union Members – 2017.” Bureau of Labor Statistics. January 19, 2018. p. 3. https://www.bls.gov/news.release/pdf/union2.pdf, retrieved July 3, 2018. 7. “The Employment Situation – May 2018.” Bureau of Labor Statistics. June 1, 2018. https://www.bls.gov/news.release/pdf/empsit.pdf, retrieved July 3, 2018. 8. “Union Members – 2017.” Bureau of Labor Statistics. January 19, 2018. Op. cit. 10. “About.” Service Employees International Union. http://www.seiu.org/about, retrieved July 6, 2018. 11. “The Employment Situation – June 2018.” Bureau of Labor Statistics. July 6, 2018. p. 4. https://www.bls.gov/news.release/pdf/empsit.pdf, retrieved July 6, 2018.